The White Oak Triathlon is one of the oldest Triathlon events in England. Now in its 30th year the event is a club organised event, for triathletes delivered by triathletes so you can be sure that the club focuses upon delivering a first class race experience. The event is located to the back of South East London, nestled between the A20 and M25 which makes it easy access for anyone coming from any corner of the South East, 10 minutes from the Dartford Toll. 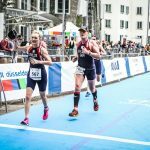 The event is an ideal first time novice Sprint Triathlon, the club has over the years focused upon ensuring athletes of all abilities can compete safely and our entire club is mobilised to marshal and provide support to athletes and visitors alike. The event is BTF sanctioned. This year the Sprint Distance race has been expanded to include 16+ age groups and teams. 16 year old entrants are required to present written parental consent to registration on the day of the event. The Standard Distance race is open to 17+ age groups and teams. All competitors will receive a medal on finishing. The event itself comprises of a pool swim (in a 33m pool not 25m), followed by one or two lap (depending on the event entered) bike ride through undulating North Kent countryside and urban areas of Bexley, Dartford and Swanley, The run is around Swanley Park (which is a great location for family picnics and has its own light steam railway). If you want to see the triathlon from 2014 went, we have a video!